This 15.6" laptop from Toshiba is one of the newest in their Satellite range, offering a 15.6" display, and priced in the mid to low range of the consumer notebook market. Named the C855-1RL, it features a substantial 500GB hard drive, 6GB of DDR3 RAM as well as Intel's Core i3 - 2328M 2.20GHz processor, all wrapped up in a red and black finish. Read on for more details of our Toshiba Satellite C855-1RL Review. 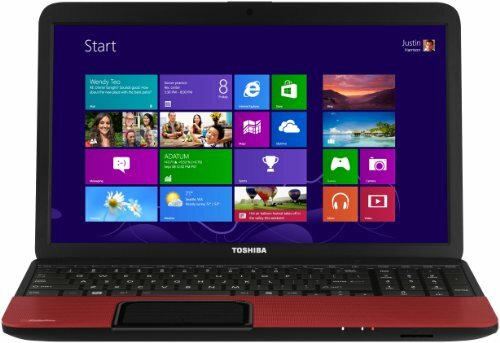 Below is our review of the Toshiba Satellite C855-1RL, a 15.6" laptop, featuring 6GB RAM, 500GB hard drive and Windows 8. If you've got a budget of around the £400 mark, and are considering a 15.6" notebook, then this review may be for you - featuring Toshiba's latest offering to the laptop market. In terms of design and appearance, Toshiba have opted for a rather striking red finish for the C855-1RL , which divided opinion in our test team. On one hand, it definitely stands out, with the red theme being carried over into the interior of the notebook, with the touch pad surround being finished in the same colour. On the other, in a market place dominated by black and metallic finishes, it seems the majority of the consumer market prefer a more subdued colour scheme. The Satellite C855-1RL features the aforementioned 15.6" display, which offers an excellent picture, as you'd expect from a household name manufacturer who also specialises in consumer electronics such as televisions. Colours appeared vibrant, and graphics crisp - we had no issues with this aspect of the notebook. Inside you'll find Intel's dual core processor in the form of the Core i3 - 2328M, offering a speed of 2.20GHz, which is supported by 6GB of DDR3 RAM - a fairly generous specification considering the price tag. The operating system installed is the latest copy of Windows 8, which is a bonus as many of the C855-1RL's competitors are still be sold with version 7. Toshiba have fitted numerous connections to keep even the most demanding of users happy - three USB, two of which are 2.0 ports, and the remaining being the faster USB 3.0. Also supplied is HDMI output, headphones and microphone 3.5mm jacks, RJ45 Ethernet, VGA, as well as a multi card reader and DVD drive. The keyboard spans the width of the notebook, providing an accurate typing experience. The addition of a number pad to the far right hand side is a handy feature, and despite this each key is still of a reasonable size, as well as being evenly spaced to help avoid typing mistakes. The touch pad is located slightly to the left of centre, and as per the rest of Toshiba's range, offered a decent level of control over the notebook. So overall what did we make of the C855-1RL? Works well, runs fast, and features a decent specification. The colour scheme may put some users off - it divided our test team. A decent entry level laptop, with a competitive specification - the only real criticism we have is the red colour scheme - apart from this aspect, we liked the Satellite C855-1RL notebook.